Pakistan’s Hasan Ali was named as ICC’s Emerging Cricketer of the Year, Afghanistan’s wrist-spinner Rashid Khan was adjudged ICC Associate Cricketer of the Year, while India’sYuzvendra Chahal claimed the ICC T20I Performance of the Year for his six for 25 against England in Bengaluru on 1 February 2017. The voting period ran from 21 September 2016 to 31 December 2017, and the winners were selected by a voting academy** that comprised respected members of the media, commentators and former players from the 12 Test playing countries. Kohli, who is the 13th player to win the Sir Garfield Sobers Trophy since 2004, was in blistering form during the voting period when he scored 2,023 runs in 18 Tests with eight centuries and three half-centuries. He scored 1,818 runs in 31 ODIs with seven centuries and nine half-centuries and 299 runs at a strike-rate of 152.55 in 10 T20Is. Kohli also won his second ICC ODI Cricketer of the Year award after having won the same award in 2012, making him the first cricketer to win the Sir Garfield Sobers Trophy and the ICC ODI Cricketer of the Year award in the same year. A delighted Kohli said: “It means a lot to me to win the Sir Garfield Sobers Trophy for ICC Cricketer of the Year and ICC ODI Cricketer of the Year. I won the ICC ODI Cricketer of the Year back in 2012 but this is the first time I have won the Sir Garfield Sobers Trophy. It is a huge honour for me as it is probably the biggest award we have in world cricket. Two Indians winning it back to back makes it more special. I also want to congratulate all the other winners. “You keep working hard every day of your life as a professional cricketer, be it training or practicing on skill sets that are required to compete at this level. Job satisfaction on the field is paramount, but international recognition by the ICC is something that every player feels privileged as it is at a global level and is something that is very special to all the cricketers because you are competing against the best international cricketers across the globe. ICC Chief Executive David Richardson said: “On behalf of the ICC, I want to congratulate Virat Kohli for winning the Sir Garfield Sobers Trophy. It is the most prestigious individual award in cricket, named after one of the most iconic cricketers and recognises a player for outstanding performances across all formats over a period of time. 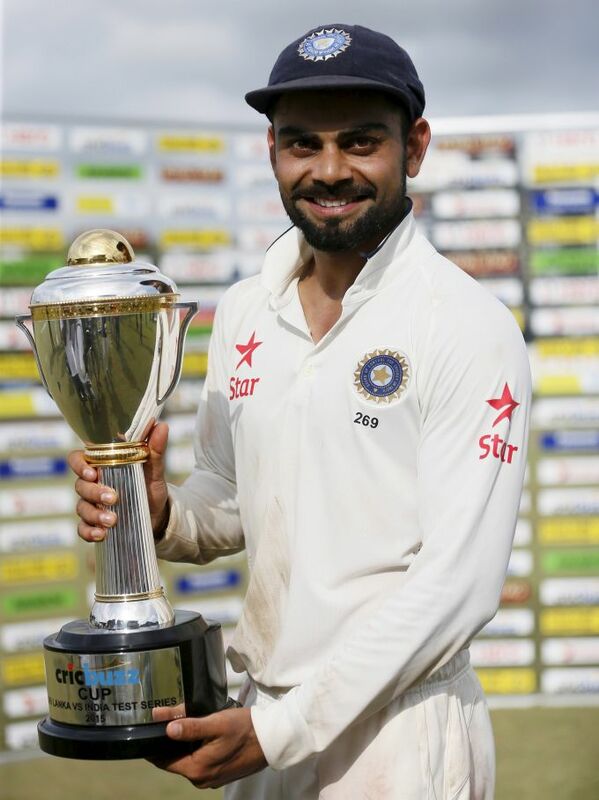 Only the best of the best have won this award and Virat certainly deserves to be in that select group of cricketers. “The fact that he has also won the ODI Cricketer of the Year and was named by the Voting Academy as the captain of both the ICC Test and ODI team demonstrates the impact he has had across the sport over the last year. “Mentions must also go to our Emerging Cricketer of the Year, Hasan Ali, and our Associate Cricketer of the Year, Rashid Khan, both of whom are exciting to watch and who richly deserve this recognition. Australia captain Steve Smith finished second to Kohli for the Sir Garfield Sobers Trophy, but has outvoted his India opposite number to win his maiden ICC Test Cricketer of the Year award. This was the 28-year-old’s third ICC award, having lifted the Sir Garfield Sobers Trophy and the ICC Test Cricketer of the Year in 2015, which had made him only the seventh player to win the two awards in the same year. In the voting period, Smith scored 1,875 runs in 16 Tests with eight centuries and five half-centuries. Reacting to the announcement, Smith said: “It’s a great honour to receive this award for the second time, having won it in 2015 as well. It’s called Test cricket for a reason, and I’ve enjoyed that test of my ability over the past 12 months. Hasan Ali capped a memorable year by becoming the first Pakistan player to be voted as the ICC Emerging Cricketer of the Year. The 23-year-old had won the Player of the ICC Champions Trophy 2017 award and finished the year as number-one ranked ODI bowler after having started the year in 75th position. An excited Hasan Ali said: “It has been memorable past 16 months for me as a young player and Pakistan as a team. And to be recognised by the game’s governing body as its emerging cricketer, is something that means a lot to me and the Pakistan cricket family. This acknowledgement will not only inspire me to do even better in the coming seasons but will also convince the next generation of cricketers that hard work and good performances can never go unnoticed. Rashid Khan, Afghanistan’s 18-year-old wrist spinner, has been named as the ICC Associate Cricketer of the Year after he helped his side to victory in the four-day first-class ICC Intercontinental Cup by finishing with 23 wickets in three matches. Rashid Khan was over the moon after hearing the news, when he said: “I'm really honoured and happy to be named as the ICC Associate Cricketer of the Year. 2017 was a good year for me and I have lots of memories from last year, which are going to stay with me for a very long time. India’s Yuzvendra Chahal (six for 25 v England) narrowly edged out Evin Lewis of the Windies (125 not out v India) and Rohit Sharma (118 v Sri Lanka) to win the ICC T20I Performance of the Year. He is the second India player to win this award after Yuvraj Singh (2008). Marais Erasmus of the Emirates Elite Panel of ICC Umpires has won the David Shepherd Trophy*** for the ICC Umpire of the Year for the second year running. He is the fifth umpire to put a hand to this trophy after Simon Taufel (2004-2008), Aleem Dar (2009-2011), Kumar Dharmasena (2012) and Richard Kettleborough (2013-2015). England’s all-rounder Anya Shrubsole has won the ICC Spirit of Cricket Award****. Shrubsole displayed humility and exemplary sportsmanship after the ICC Women’s World Cup semi-final against South Africa in Bristol when, after hitting the winning boundary with two wickets and two balls to spare, she opted to comfort distraught captain Dane van Niekerk before celebrating with her teammates. It was an act reminiscent of Andrew Flintoff consoling Brett Lee at Edgbaston in 2005 and Grant Elliott comforting Dale Steyn after the ICC Cricket World Cup 2015 semi-final in Auckland, demonstrating the true spirit of cricket. Pakistan stun India to win the ICC Champions Trophy 2017 has been voted by the fans around the world as the inaugural winner of the ICC Fans Moment of the Year.